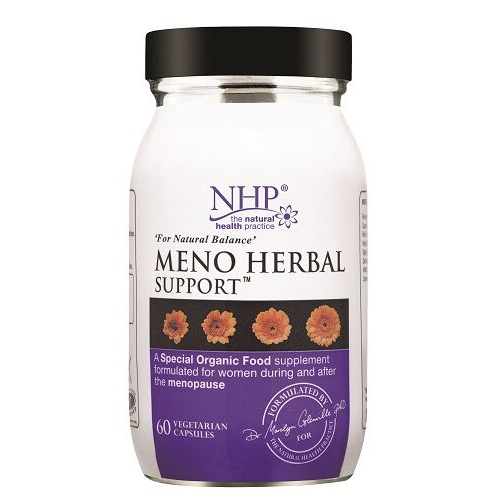 Natural Health Practice - Meno Herbal Support is a special organic, herbal supplement to support women and help balance hormones during and after menopause. Meno Herbal Support from the Natural Health Practice is a supplement specifically formulated for women to help you take back control over this stage in your life. It contains a combination of carefully chosen nutrients. Packed full of good sources of phytoestrogens including fermented soya, red clover, hops, sage, dandelion, alfalfa and flaxseeds, a good source of lignans. Meno Herbal Support is free from gluten, yeast and dairy products. It is made without the use of artificial flavours, colours or preservatives, it is Kosher and approved by the Vegetarian Society. Capsule Shell: Hydroxypropyl Methylcellulose, Fermented Siya, Red Clover, Hops, Sage, Dandelion Root, Alfalfa, Flaxseed, Vitamin B6. Below are reviews of Natural Health Practice Meno Herbal - 60 Capsules by bodykind customers. If you have tried this product we'd love to hear what you think so please leave a review.